Did you ever think that balancing household management and mom life would be so hard? You had no idea you’d be so tired, frustrated, and overwhelmed, right? This guide walks you through some of the major areas of spring cleaning the busy mom way. It has been spring for a few days now, so its officially time to start opening the doors and windows and cleaning house. But if you are like me, you don't suddenly have tons of time to devote to cleaning. This post will break down how to get that deep down clean feeling in your flooring, windows, and curtains with simple steps and in less time! Getting your kids to bed is hard. They don't want to go to bed yet, they want these pjs not those, they need 10 bedtime stories, now they need water.... Getting the kids finally settled can be exhausting especially when you are already exhausted. I'm usually on my own for bedtime since my husband mostly works nights. Because of this, I have developed a process that gets both kids to sleep without fuss 6 out of 7 days a week. We love showing off pictures of our kids. However, if you are like me, these pictures don't always make it on display at home. Check out how to easily get your picture from your phone to your wall. I hate cleaning. Plus sometimes it just feels like a wasted effort when the mess is back an hour later. And then if that weren't enough to dissuade you, the time it takes can be incredible. Hours to clean what takes my kids 30 seconds to dirty. On the other hand, the peace of mind that comes with a clean and organized home is amazing. You can physically feel the difference when you enter a clean room. It also does wonders for your mindset! So, in order to help you get in and out of cleaning mode more quickly, here are some tips to make cleaning go faster. In case you haven't been over to my social media in a bit, I am currently a contributor of the Westchester County Moms Blog (WCMB). This is a site for local moms to get information about local events, services, advice, and just bond with other moms. The site is very new but is growing quickly. It is a part of a sisterhood of sites across the country. That means that articles I write for the local site have the possibility of being published on any of the other sites across the nation. This is super exciting and a great opportunity. An added bonus is that I get to bond and interact with other local mom bloggers. So, as you know, I am currently 1 week into my month off from grad school. Even when I do go back in mid January, I will only be taking 1 class in the coming semester. The past 4 semesters I have been taking 2 classes. Therefore, hopefully the work load will be less. In the meantime, I have decided to take advantage of this reprieve by reading a few books. These are books that have long been on my must read list, but I just haven't had the time. I have heard wonderful things about them and I can't wait to dig in! Join me on this reading Journey and let's compare notes! Every year at Christmastime we make time to bake cookies together. One recipe in particular, I have been making since I was in grammar school. They are the most delicious Chocolate Chocolate Chip cookies ever. Now I won't proclaim to be some fabulous baker, but these really are delicious. What's more, one recipe makes about 5 dozen so you really get good bang for your buck. They are great to package up and give as gifts or to bring to parties. So let me take you though our Sunday of baking! If you have not yet heard of Lula Roe, consider this your wake up call. Leggings and mom life go together like peanut butter and jelly, Abbott and Costello, Batman and Robin. Lula Roe has some of the most comfortable leggings I have ever worn. They are so buttery soft, it's like a second skin! Plus, the designs are so fun and unique. Don't worry,Lula is about way more than leggings! Lula can take you from casual holiday get togethers to fancy holiday parties! You may or may not have realized this, but men and women are built differently, and I don't just mean physically. By nature, we are innately wired to think and interpret situations differently. We react differently in a given situation and we prioritize differently. Today, in light of the never ending to do list that comes with the holiday season, I thought we'd discuss how the difference between men and women relates to nagging: i.e. repeatedly bring up what needs to be done and the fact that it hasn't been done yet. As you know, Hailey was diagnosed with hypothyroidism when she was only 6 days old. While every mom worries about the growth and development of their babies, this condition caused me to be even more on alert. I made it my mission in incorporate tools for healthy brain development in our everyday life. This includes breast feeding and iron-fortified Gerber Cereal. Today, I wanted to talk about birthing classes. These classes are a very important part of pregnancy, if not for what to actually do in the birthing room, at least to provide new parents more peace of mind. Since the hubs and I have opposing work schedules and don't have a lot of time home together, the last thing we wanted to do was to use that time to go to prenatal classes. On the other hand, we could definitely use a brush up on what to expect and techniques to use, and just newborn information in general. It had been a while since our 3 year old was a baby. We decided to take to the internet to find a resource that was informative, but didn't take us out of the house. 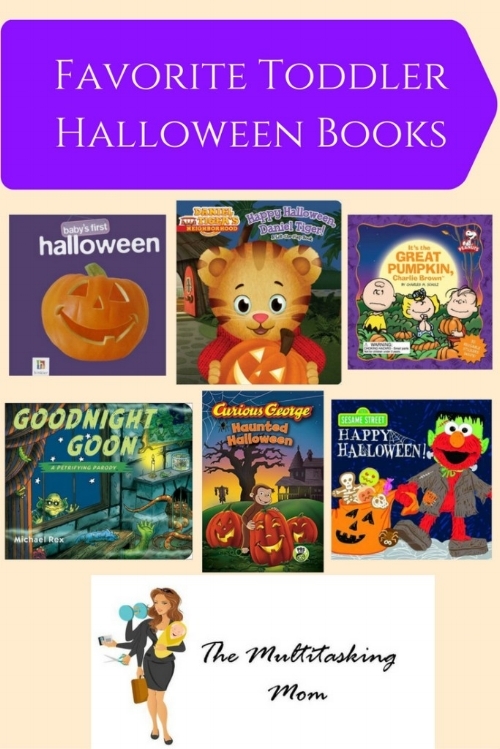 With Halloween coming up, we have decided to intersperse our favorite Halloween story books into the mix of our bedtime stories. We have accumulated several of them over the years and I'm sure we will continue to add to the list. As of today, the following 6 books are our favorites. They include entertaining stories, interactivity, and of course Halloween fun. Tyler loves Daniel Tiger and we love the positive messages presented in the show, Daniel Tiger’s Neighborhood. Daniel Tiger actually was a big help in getting Tyler ready for his baby sister. We can talk about that another time. In this book, Daniel and his friends are getting ready for Halloween. The book takes you through each character’s costume and you use clues to guess what they are going to be. The flaps make this a fun book to read with toddlers. If you like Goodnight Moon, then you will thoroughly enjoy this Halloween parody. In similar style to the original, this book takes you through the things in the little monster's room at bedtime. The difference is these items include goo, a witch, a werewolf, a black hat, and more. The pictures are cute, not scary, so it's enjoyable for the kids. This story is actually one of my favorites. Probably because I am a BIG Edgar Allen Poe fan. I just love the rhythm of his poetry. This book is written with the same rhythm as Poe's The Raven. This makes it as fun for me to read as it is for Tyler to hear. The story describes the Count waiting as guests arrive for his Halloween party. There is definitely some knocking at Count's castle door. The story features your favorite Sesame Street characters dressed in their Halloween best. In the end, you are invited to the party too! This book is of the classic Charlie Brown story. We all know this story, or at least we should. If you don't know it, do yourself a favor and watch the movie. Let your kids see it too. It's just one of those things that everyone should do. Anyway, the best part of this book is that it comes with reusable stickers. I don't know about you, but my toddler loves stickers. This book has places to put stickers on every page in order to fully illustrate the story. This has been a hit with Tyler night after night. This book is an abridged version of the cartoon "Curious George's Boo Fest". Its a cute story where George gets spooked after hearing the story of No Noggin about a monster that steals hats. The best part is that it is an unscary scary story. As in your child will feel like he/she is enjoying the scary story experience without actually being scared. This is really an early reader book, but T liked it a lot. It is a great length book for toddler bedtime, too. This was Tyler's first Halloween book and we are keeping it in the mix mainly for Hailey's benefit. However, Tyler does request it himself every once in a while. Like most baby's first books, this book contains photos of various Halloween related things with the name of the item below the picture. I believe that T like that some of the pictures are of kids dressed up in costume. For example, the monster picture is a baby boy dressed up as a monster. It's a cute book for little ones. For more Halloween fun, check this Halloween Handprint Craft. We will also be posting a new Halloween Craft project later this month so stay tuned. With Halloween coming up, I thought it would be helpful to put together a list of fun DIY costumes. But, unlike many other lists, this list makes sure you get the most bang for your time. This means least complicated but with great outcomes. I know, I know, it's not even Halloween and I'm talking holiday shopping. I'm the first to complain when I see Christmas decorations up before Thanksgiving. I am all about giving each holiday it's due. Plus now that I have a child that can actually anticipate holidays, I don't need him pestering about presents so far in advance. On the other hand, there is no logic to cramming all that shopping into the month of December. I mean with so many other holiday things to do like holiday parties and visiting Santa, who can possibly do all that and not stress?! Not I. For me, slow and steady wins the race. 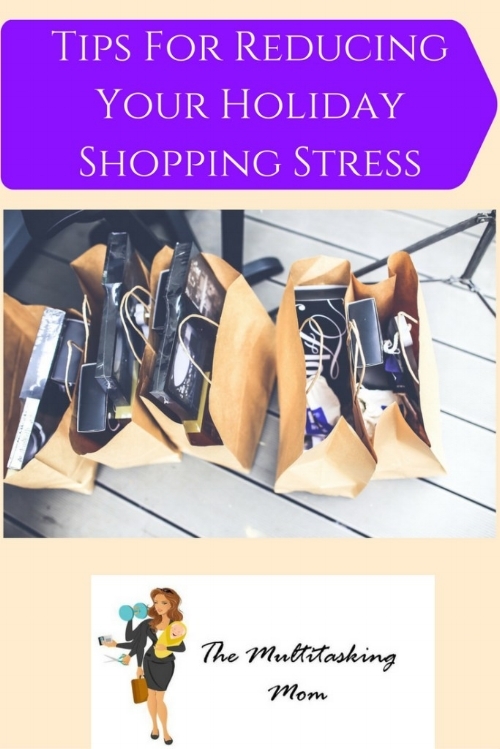 So, here are some tips on how I keep holiday shopping stress free. If you haven’t started yet, start now. There are two big benefits to this; time and money. Starting early means you have months to get your shopping done instead of weeks. No pushing your way through over crowded stores. No running around on Christmas Eve. No rushing from store to store because what you want is sold out. Expense wise, you get to spread the cost of the holidays over multiple months prior to the holidays. Unlike spreading the cost over multiple months after holidays, this method does not involve paying interest. Make a list but only be super specific when you have to be. For example, Tyler is at an age where he wants specific things. He wants to complete his collection of Ghostbusters mystery minis, and he wants certain Lego sets. Items for him are very specific. Hailey on the other hand is unable to voice her opinions. Therefore, her list might look more like: clothes, stuffed animal, educational toy. For my brother I might write model train equipment. Then anytime I find model train equipment on sale, I can buy him something and check him off my list. The less specific you can be for people, the better. Then you have a broader range of options and can find better deals. Of course, you want it to still be something they would want/need and like. If you have been through any gift giving occasion with kids before, you know you will be bombarded with questions from relatives of what to get your kids. Be prepared. Once you make the list of things that you will be getting your kids yourself, make a second list of things that they want or need. Keep this second list with you as well or give it to your husband, but not both. You need to have a designated go to person for this list. You don’t want both parents giving items out because the whole purpose here is to avoid multiples of the same gift. Now when someone asks what to get your kids, your go to person can give them items from your list. Be aware that these people may not necessarily get the item you suggest to them, but you can hopefully prevent multiples of the same gift. You also avoid the texts back and forth “did you get so and so this?”, “No, OK then I’m getting it”, “OK so then what should I get them now?”…. You can always hold onto the list and if your kids didn’t get the item for Christmas, now you already have a list for their birthday! I hope you find this list helpful! Do you have tips to reduce holiday shopping stress?? If so leave your tips in the comments! There are so many ways to celebrate the holiday season. Here are the traditions that we hold near and dear. I have scoured the inter-webs for videos of holiday DIY projects that are easy and elegant all at the same time. Things you are totally capable of doing and would be proud to show off in your home. Holiday goals are short term goals that cover all aspects of life. These are super important to ensure you have a successful, enjoyable holiday season without regrets. Some toddlers are great eaters. You put food in front of them and they immediately lift their plastic fork and dig in. Others who were great eaters as babies become the pickiest of eaters in toddlerhood. My toddler falls into the second category. In order to ensure that T actually gets some quality food into his belly, the hubs and I have a few tricks we employ. Here are some things that work best with our toddler and may even work for you. Toddlers always want things that they can't have. Actually that might go for adults too, but in this case we just care that it works for toddlers. My husband is the best at this game. If T doesn't show interest in eating his meal, the hubs will say, "Mom, don't let Tyler eat that (insert food item here). It's mine!" T will of course respond, "No it's mine." So with a little back and forth of "I'm going to eat it", "No, I'm going to eat it", it eventually gets eaten, by Tyler. My toddler likes to win. Maybe yours does too. In the mornings, sometimes we race to eat our cereal. By we, I mean that I eat my food at my normal pace and occasionally throw out phrases like "I think I'm going to finish first". T actually likes cereal and would eventually eat his whole serving anyway, but this makes sure that it happens in say 20 minutes instead of like an hour. My son happens to be very careful in his eating, I wouldn't recommend this one if your kid is likely to scarf down his food too quickly. As I said, I don't increase my speed I just throw out a little taunt if he is becoming distracted. Fact: Toddlers love finger foods and they love snacks. Stock up on a variety of healthy snacks that you can put together to make a meal. You can stock up on whole grain crackers, veggies, hummus, fruit, nut butters, and tons of other healthy snack items. Put these together and you have a great lunch for a toddler! It's both healthy and fun to eat. The key to this one is to only have healthy options. Then no matter what snack food they pick you can be happy giving it to them. A fun way to get toddlers to try new healthy snacks is to make it into a game. Recently, T and I headed to Walmart to pick up the Gerber Lil’ Beanies snacks. They have 2 flavors, original and white cheddar broccoli, so it's perfect for the game we wanted to play. How does this fit with getting toddlers to eat healthy? Gerber Lil’ Beanies is made from the goodness of navy beans to deliver 2 grams of protein (9% Daily Value), 1 gram of fiber, and 10% Daily Value of Vitamin E per serving. Plus it's baked, not made with genetically engineered (GM) ingredients, and is naturally flavored! You can try this snack yourself by heading over to Walmart and picking up a container. 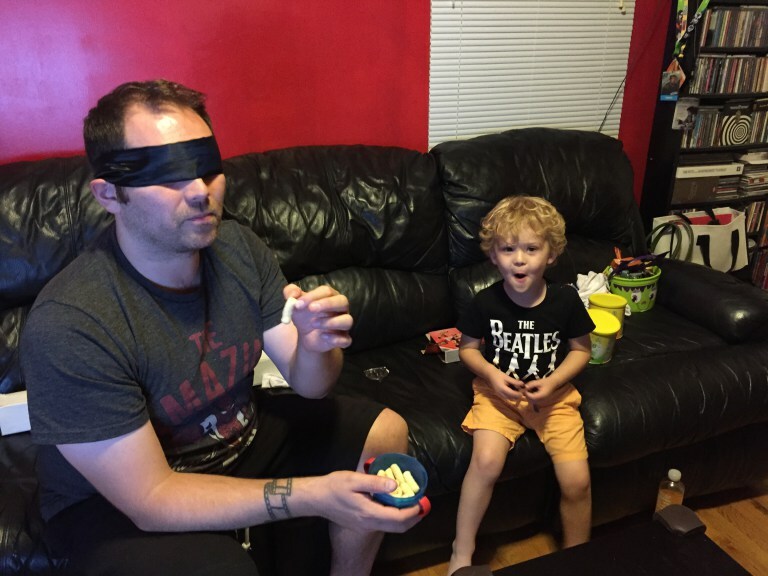 You can try one at a time or try our game and see if your toddler can pick out the flavors! Be sure to register your purchase with iBotta to get 50 cents back! Remember this was one of my favorite money making apps I told you about a while back! I hope you enjoyed these tips! Tune in Friday when I will be doing my 20 week postpartum update including tips on how to stay motivated to exercise!